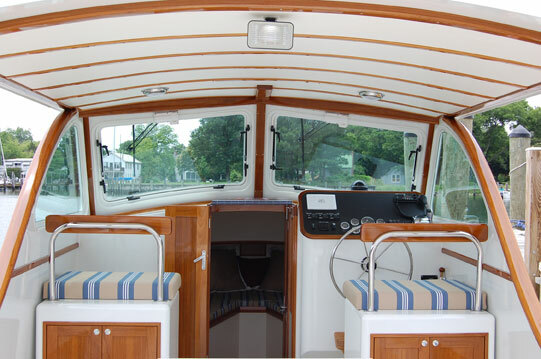 The Campbell 31’ comes in two hull designs– an Express Cruiser (left), built on a Duffy hull, and a Bay Launch built on a traditional Chesapeake Bay deadrise hull (right). The Express is powered by a six-cylinder 300-hp Yanmar diesel engine, cruising at just under 20 knots while the Bay Launch is powered by a 380-hp Cummins which quietly pushes her up to 26+ knots with a comfortable 18- to 20- knot cruise. Both designs are exceptionally well built and versatile. 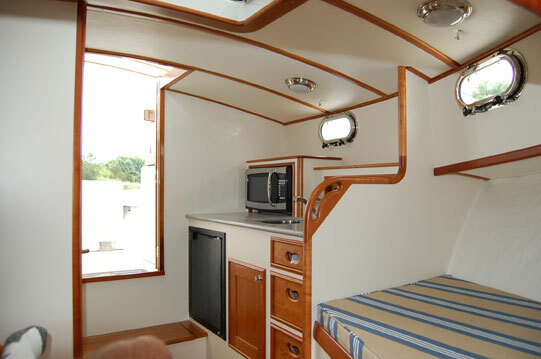 Designed as a weekender/photo platform, their basic simplicity has been finished to a level commensurate with finer yachts, though still rugged and reliable.